Another smashing guest post by Talia – find her first on here and why not peruse her blogs Teafull and The Gibson Girl’s Guide to Glamour? This was another of my inherited cookbooks — Cooking For One by the team at Better Homes and Gardens. My grandmother lived on her own from about 1985 when my grandfather died, till around 2010 when some cousins of mine came to dwell in her basement due to financial troubles. Not long after this, she needed professional nurses to come help as her health wasn’t keeping up with her. 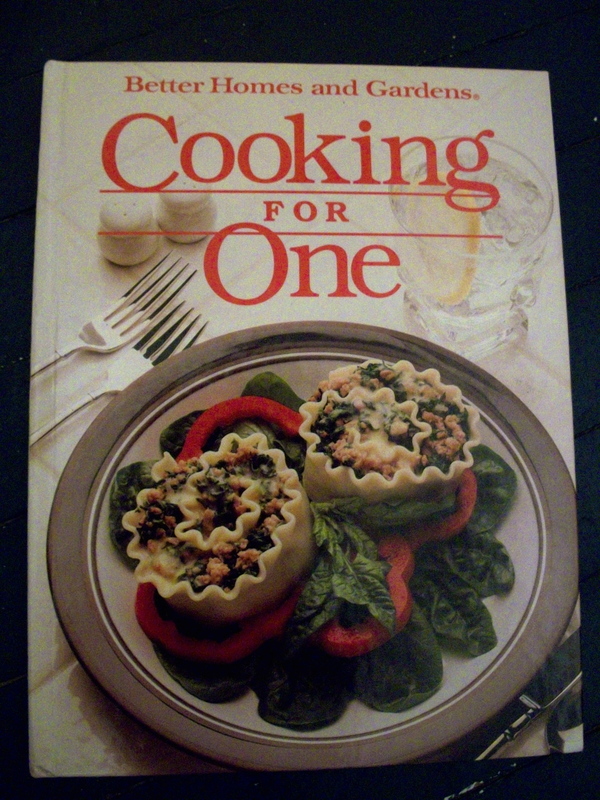 Family always lived nearby, but she seemed to like being independent; and I can imagine she probably used this cookbook a lot, since dining solo would have been her standard way of life. Some suggestions include egg in a basket, croissant sandwiches, an ingredient heavy but still single-serving salad niçoise, the questionable sounding (but probably fashionable today) bacon and peanut butter tostada, and more. In a small heavy saucepan, melt the margarine or butter. Stir in flour, salt, and pepper till blended. Add milk all at once, Cook and stir over medium heat till mixture is thickened and bubbly, then cook and stir for 1 minute more. To store, refrigerate in an airtight container for up to 4 days. Makes about 1 cup. Using 1/4 cup Basic White Sauce, stir in 1 tablespoon chopped fresh watercress, 1/4 teaspoon Dijon-style mustard, and dash ground nutmeg. 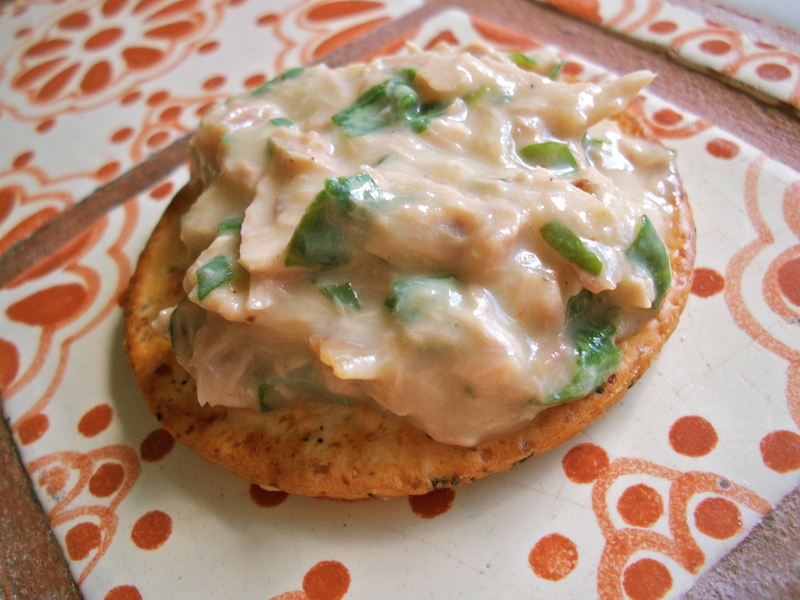 I used the finished Watercress Sauce mixed with some canned tuna and some bacon, to make a pretty good little tuna salad. To do it this way, add the whole recipe of watercress sauce to 1 standard sized can of tuna and about 2 strips of bacon, finely crumbled or diced, and mix it all up well. Eat it on crackers or bread or a potato or whatever. An interesting thing about this little watercress tuna salad recipe, was it ended up being a great lesson to me in how the quality of your ingredients really effect the flavor of your food. See, I made a batch of this one time in Scotland, and one time after I returned home to the US. US has crappy food; it’s all bred to be large, and hold up well to transportation, and to not taste like anything (I assume intentionally for the sake of consistency season to season.) 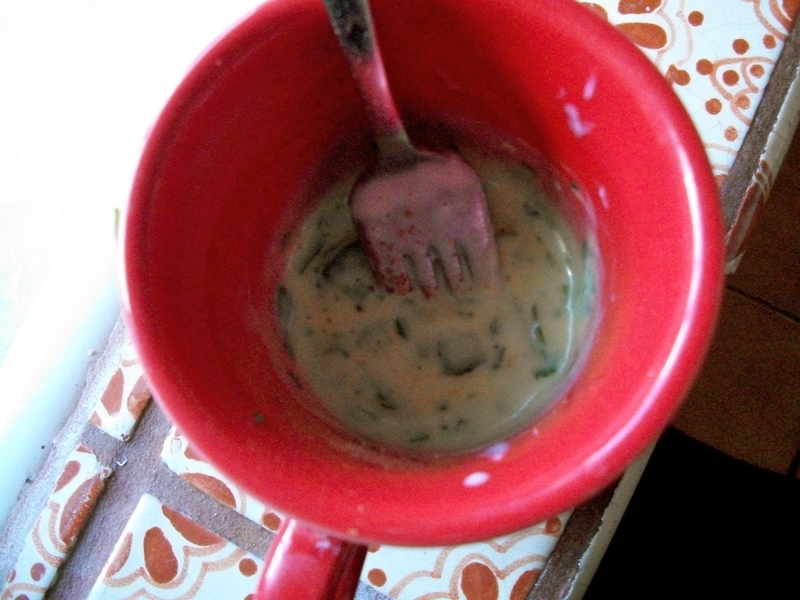 Consequently, the white sauce made with Anchor butter and Scotmid watercress was way tastier than the stuff I had to use in the US. You can also get BRINED tuna in the UK which you pretty much cannot find in the US, so the fish tastes a lot better since it’s been salted through; adding more salt to the recipe just doesn’t get the same result. All in all it is a pretty fun little cookbook, I hope I’ll get to try some more of the recipes in the future. This entry was posted in 1980s, Cooking for One and tagged butter, milk, mustard, nutmeg, plain flour, watercress. Bookmark the permalink. I like the idea of watercress sauce but I’d put it with canned Salmon as I dislike Tuna. I am surprised that you say how bland food is in the US and inordinately pleased that you enjoyed British (NZ in the case of Anchor) food. Other classic cooking-for-one books are Katharine Whitehorn’s “Cooking in a Bed-sit” and Delia Smith’s book to accompany her One is Fun t.v. series. K.W.’s is very entertaining and also has practical advice. I think it was reprinted fairly recently. I shall investigate the KW salada, thank you. Good for first time away from home Uni students? I want to get my hands on this cookbook. And then slit my wrists. KW’s book may sound a little dated as she wrote it in the early 1960’s. The reprint may have revisions, I haven’t seen it. Sounds like a fascinating book. @Salada Cooking in a Bedsitter contains the single best introduction to a cookery book ever written.